Hundreds of marches took place worldwide. 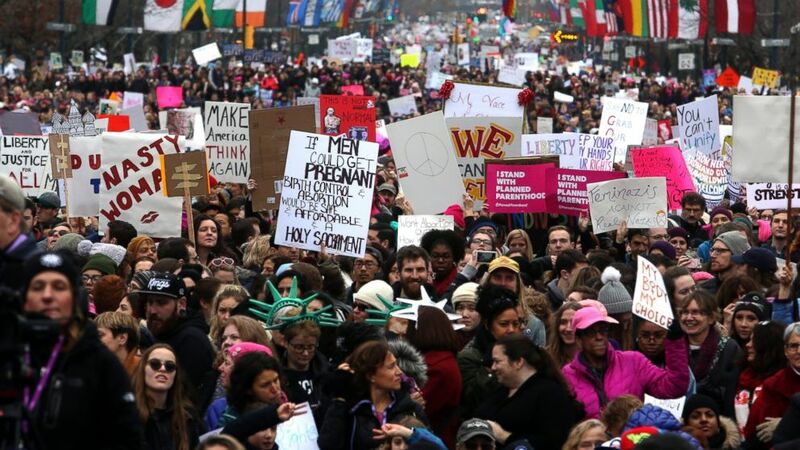 More than 1 million people rallied at women's marches in the nation's capital and other cities around the world Saturday on President Donald Trump's first full day in office. "Welcome to your first day. We will not go away," marchers in Washington chanted. Along with women, many in pink hats, plenty of men showed up, contributing to the turnout everywhere from New York, Philadelphia, Chicago and Los Angeles to Mexico City, Paris, Berlin, London, Prague and Sydney. The Washington rally alone attracted over 500,000 people according to city officials. It was easily one of the biggest demonstrations in the city's history, and as night fell, not a single arrest was reported. The international outpouring served to underscore the degree to which Trump has unsettled people domestically and abroad. "We march today for the moral core of this nation, against which our new president is waging a war," actress America Ferrera told the Washington crowd. "Our dignity, our character, our rights have all been under attack, and a platform of hate and division assumed power yesterday. But the president is not America ... We are America, and we are here to stay." Turnout in the capital was so heavy that the designated march route along the National Mall was impassable. Protesters were told to make their way to the Ellipse near the White House by way of other streets, triggering a chaotic scene that snarled downtown Washington. Long after the program ended, groups of demonstrators were still marching and chanting in different parts of the city. 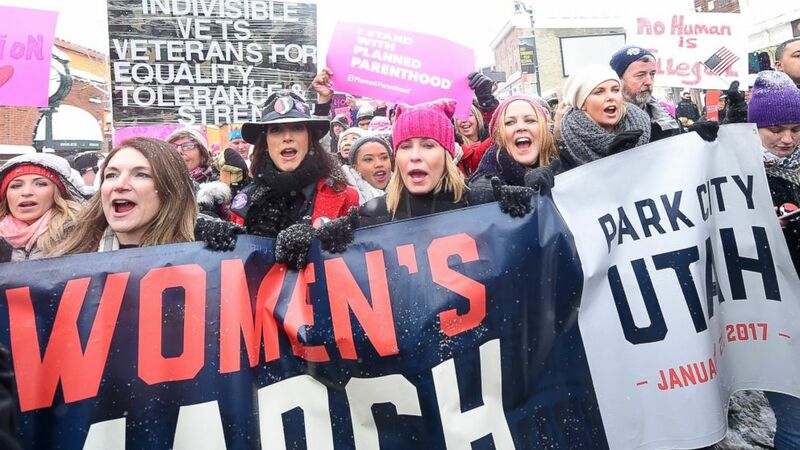 The rally featured speeches from women's rights activist Gloria Steinem, Planned Parenthood President Cecile Richards, Madonna, actresses Ashley Judd and Scarlett Johansson and director Michael Moore, among others. A group of largely female senators and other politicians took the stage together at one point — including Kirsten Gillibrand, D-NY; Claire McCaskill, D-Mo. ; and newly elected Sens. Kamala Harris, D-Calif.; and Tammy Duckworth, D-Ill.; who addressed the group, as did Rep. Maxine Waters, D-Calif. Also onstage were Rep. Debbie Wasserman Schultz, D-Fla., and Sen. Cory Booker, D-NJ. Various causes were attached to the march, which was largely billed as a demonstration in support of women's rights and civil rights but for many had clear political undertones connected to the inauguration of Donald Trump. Steinem thanked the crowd for showing up, declaring, "We have people power, and we will use it." "Thank you for understanding that sometimes we have to put our bodies where our beliefs are. Sometimes pressing Send is not enough," she said to the crowd, many of whom wore bright pink knitted hats. 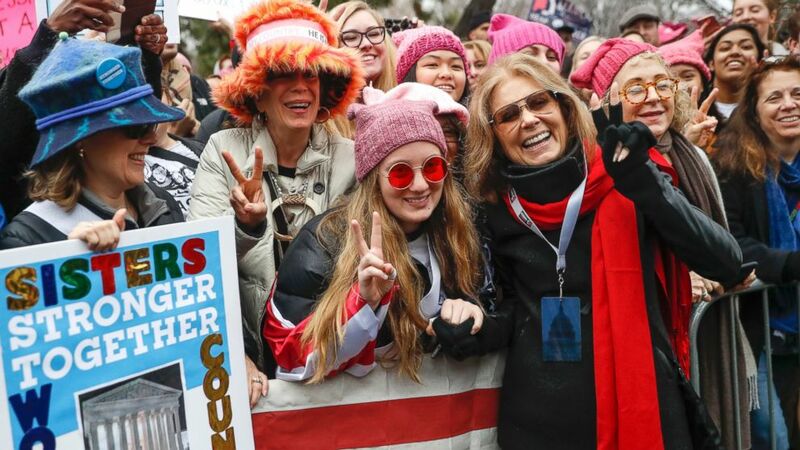 (John Minchillo/AP Photo) Gloria Steinem, center right, greets demonstrators at the barricades before speaking at the Women's March on Washington during the first full day of Donald Trump's presidency, Jan. 21, 2017 in Washington, D.C.
Steinem suggested that the size and energy of the gathering was a positive outgrowth of Trump's election and inauguration. "This is the upside of the downside. This is an outpouring of energy and true democracy like I have never seen in my very long life. It is wide in age. It is deep in diversity," Steinem said. She praised "our great leaders" Barack and Michelle Obama, Sen. Bernie Sanders and Hillary Clinton, "who told the whole world that women's rights are human rights and human rights are women's rights," quoting Clinton's speech at a United Nations conference in 1995. Steinem then turned her focus to Trump. The new president's "Twitter finger must not become a trigger finger," she said. Shortly before Steinem took the microphone, Ferrera was one of the first speakers at the rally before the march, calling for supporters to "fight, oppose" the Trump administration. (Michael Loccisano/Getty Images) Jennifer Beals, Chelsea Handler and Charlize Theron participate in the Women's March on Main Street, Jan. 21, 2017 in Park City, Utah. 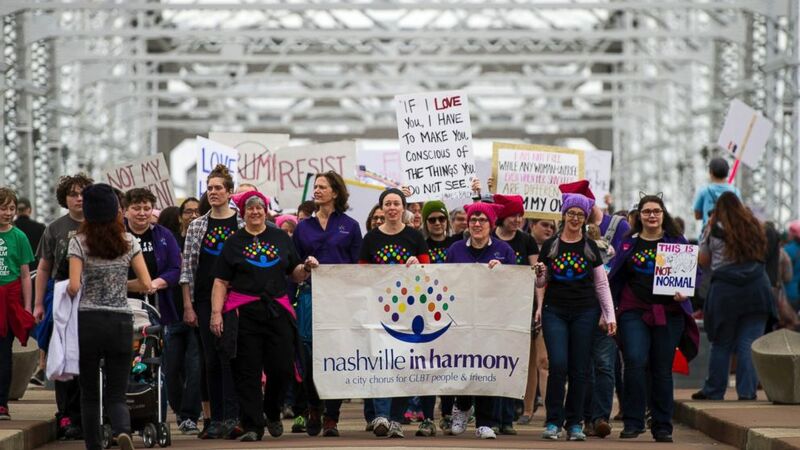 (Andrew Nelles/The Tennessean via AP) Demonstrators depart from the John Seigenthaler Pedestrian Bridge during a march in solidarity with the Women's March on Washington, Jan. 21, 2017, in Nashville, Tennessee. "Marchers, make no mistake. We are — every single one of us — under attack. Our safety and freedoms are on the chopping block," she said. Some of the homemade signs at the rally were related to Clinton, Trump's campaign rival. One read, "Still with her," a play on Clinton's campaign slogan, and another read, "Lock him up," flipping a chant that some Trump supporters directed at Clinton during the campaign. Several "Stronger together" posters from the Clinton campaign were spotted as well. While she wasn't there in person, Clinton gave her support via Twitter. (Jacqueline Larma/AP Photo) Thousands of protesters fill the Benjamin Franklin Parkway as they participate in a Women's March, Jan. 21, 2017 in Philadelphia. During his speech, Moore railed against Trump, telling marchers to take action against his administration. "We have to get busy, folks. We've got our work cut out for us," Moore said. In Chicago, organizers canceled the march portion of their event for safety reasons because of an overflow crowd of an estimated 250,000. People made their way through the streets on their own anyway. In New York, well over 100,000 marched past Trump's home at glittering Trump Tower on Fifth Avenue. More than 100,000 gathered on Boston Common, and a similar number demonstrated in Los Angeles. In Miami, real estate agent Regina Vasquez, 51, had a sign saying "Repeal and replace Trump." "I believe that strength is in the numbers and that we should all come out and not make Trump the new normal," she said. More than 600 sister marches were planned worldwide. Crowd estimates from police and organizers around the globe added up to well over a million.